This past semester, students enrolled in two First-Year Seminar sections at UNCW collaborated with local businesses to create and implement community service projects. FYS is one component of University Studies, UNCW’s general education program required of every student. The course supports new students academically and personally as they integrate into the college experience. The small, highly interactive cohorts are designed to foster a sense of community, increase peer connections and an awareness of campus resources and activities. The EDGE (Explore, Discover, Grow, Engage) option incorporates the common FYS curriculum, with the added component of leadership and community service. As a result, students gain communication and project management skills while building a professional network and relationships with local businesses. During the fall, five area businesses – Live Oak Bank, Tek Mountain/Castlebranch, New Hanover Regional Medical Center, NC Coastal Federation and Corning – worked with students enrolled in the EDGE sections to provide a practical, applied learning experience. They each proposed a challenge for the students to create a service or philanthropy event that aligned with the respective company’s mission. Student groups pitched their ideas in early October and worked with the businesses to implement the winning ideas in early November. The idea grew from a pilot project in fall 2015, aptly coined “The Pitch.” The project urged students to research their assigned company and customers, creatively analyze the challenge and develop an effective, innovative solution to benefit both the business and the local community. Student groups had five minutes to pitch their solution to business representatives. Live Oak Bank’s student group traveled to Crossnore, a foster care facility in the Blue Ridge Mountains, and hosted a fundraising event for a Crossnore student to attend UNCW or Cape Fear Community College. Students working with Corning orchestrated a science, technology, engineering and math (STEM) event at G.L.O.W. Academy in Wilmington. NHRMC’s student group implemented a tailgate event before a UNCW basketball game, recognized two hospital members during halftime and promoted the NHRMC Foundation. The challenge from Castlebranch/Tek Mountain was to create a survey to match employees with community service opportunities suited to their interests. Another set of students working with NCCF helped with clean-up efforts in Carolina Beach. Hanson said they plan to again collaborate with local businesses in the fall of 2017. 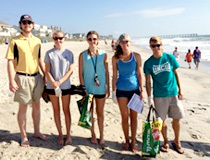 UNCW students worked with NC Coastal Federation to clean up a section of Carolina Beach.